As one of Next’s top 10 most engaged bloggers (check me out! 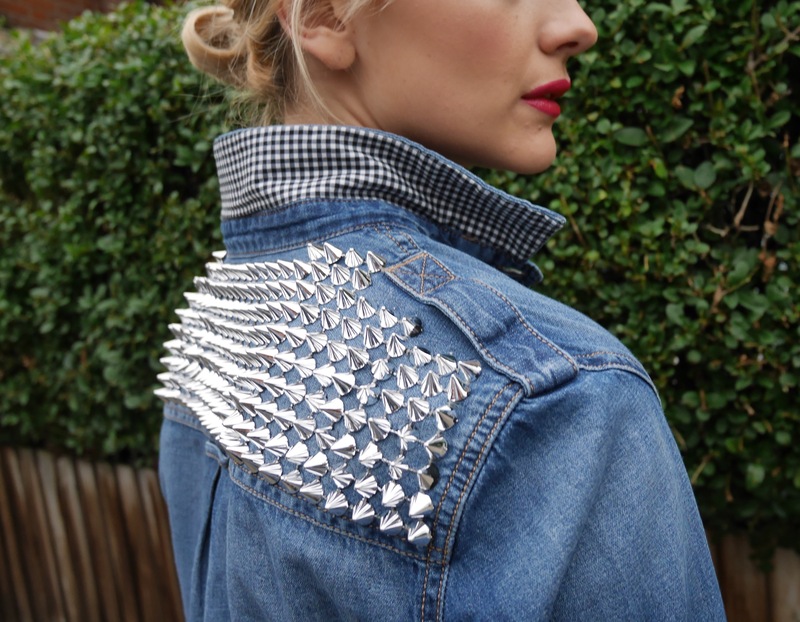 )I was invited to customise a denim shirt from their new season collection to make it my own as a one-off personalised piece. I love a reason to get creative and whip out a needle and thread, though don’t often have the time so this spurred me on to do something I love and I’m pretty pleased with the result! After having a browse on Pinterest for inspiration I thought to add some embroidery, perhaps with a monogram. That was until I went to the Haberdashery, spotted a roll of silver studs and my inner Magpie was won over. 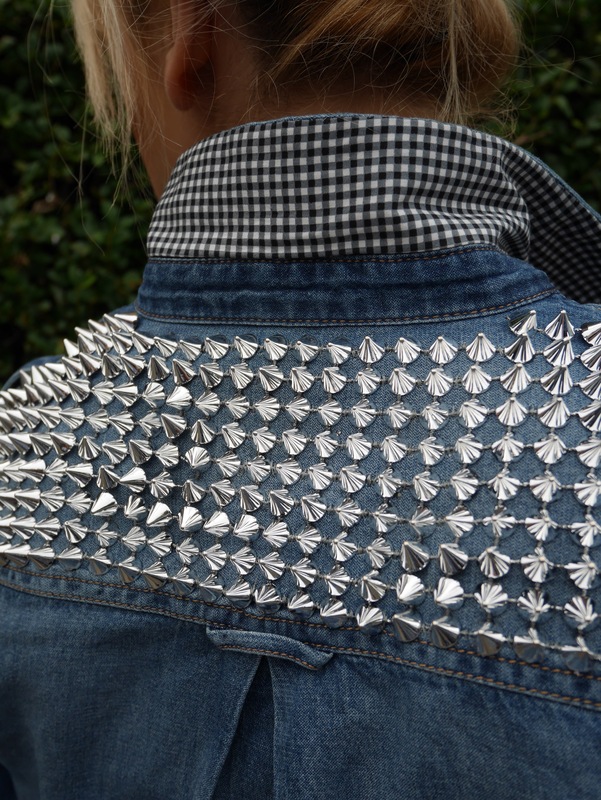 I then decided on teaming the studs with black gingham (a trend fabric for next summer no less!) and replacing the brown buttons with a high-shine alternative. Unpick pocket flaps and remove for a distressed touch. Remove tabs from inside sleeves. Cut out collar shape in the gingham and iron on to underside of collar with Bondaweb, tucking the edges in. Hand sew using hidden stitches to secure gingham to shirt collar. Lay out the strip of studs and cut to fit back panel and front pocket. Tack studs on to shirt using contrasting thread (so it’s easily visible to remove later) to hold in place while sewing. 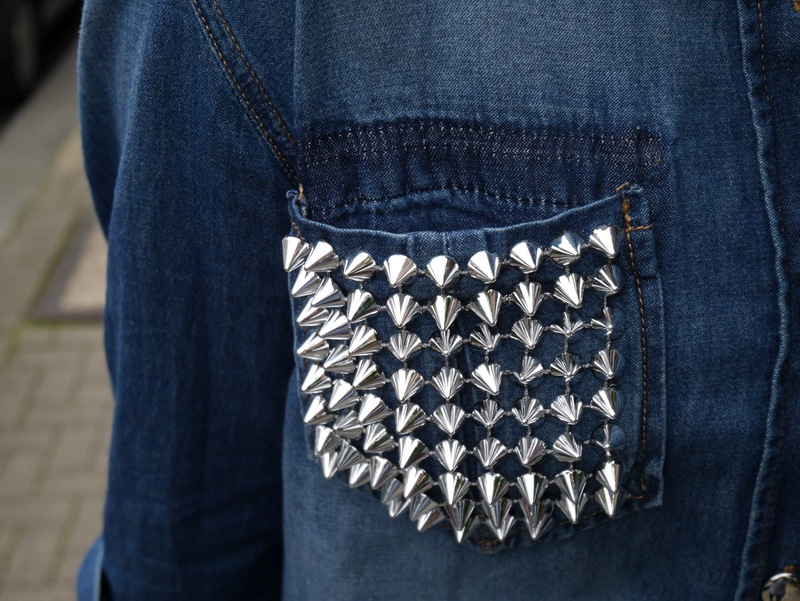 Using a grey thread (somewhere between the shade of denim and the grey thread between studs) hand sew a few stitches across each thread joining the studs to one another. This takes some time! 1. Here I’ve worn my new-look shirt with leather leggings and leopard for a full rock chick vibe. 2. It will also work well worn as a jacket over a jersey roll neck (key for A/W15!) with jeans. 3. Layer the shirt over a fine knit grey sweater with black jeans and leather ankle boots. 4. Tuck into (or tie at waist) a leather skirt and wear with heels for evening or flats for daytime. 5. Wear as a light jacket over a simple dress and add leggings and boots. Voila! One affordable item, personalised with just a little effort, and at least five ways to wear it. Don’t say I’m not good to you! Final snap taken by my keen 21month old! 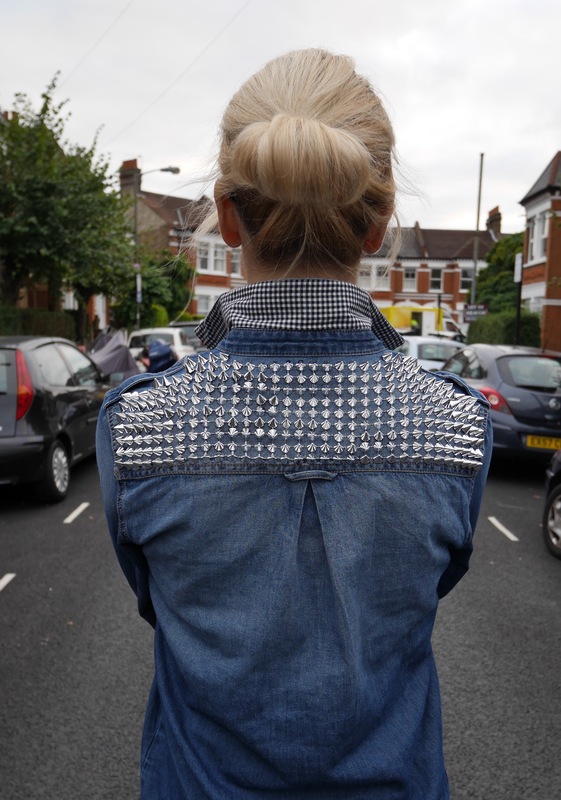 Take a look at the blog post which inspired Next to get us customising over on the fab FashionForLunch.net. Thank you Next for kindly giving me this shirt to play with! 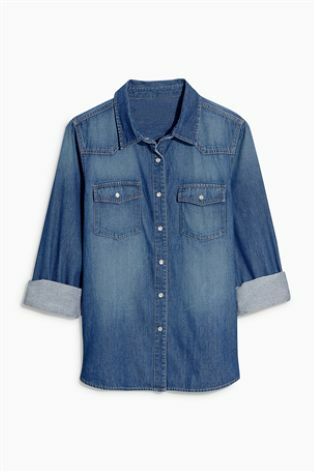 How would you give a denim shirt a new look? You are so so clever I love this!